Functional Armour for use in Re-enactments, Theater, Movies, LARP, Medieval Fairs and the SCA has to be able to fit all kinds of situations and meet group guidelines. We carry all types of functional steel armour to meet these needs. We have off the rack armour, customized armour, sized to your measurements, and many come with your choice of steel thickness! Our functional steel armour section includes functional arm armour, pauldrons, functional gauntlets and arm bracers. 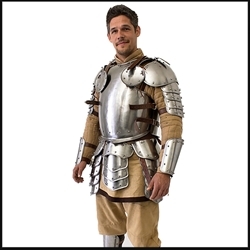 We also carry full suits of functional and wearable steel armour and breastplates. Steel leg armour protects your thighs, and steel greaves to protect your shins. Functional Arm Armor and Pauldrons for the Arm and Shoulder. Most groups require steel pauldrons for the shoulder and steel elbow cops for the elbow. Full steel arm armour, including the pauldrons will protect your entire arm. Medieval Re-enactment groups, including the SCA require you to have Functional Gauntlets and Arm Bracers that meet their requirements. Our steel armour has been designed to suit the needs of these medieval re-enactment societies. Functional Steel armour for the Legs and Shins. We carry steel Greaves, steel knee cops, thigh armour or cuisses and Full Steel Armour Legs to protect the front thighs, knees, entire lower legs and feet. Display, SCA, and Stage Work! Medieval Re-enactment groups, like the SCA, require you to have Functional Neck Armour - Gorgets that meet their requirements. Our neck armour meets these requirements and also those of Stage, Movie, LARP and other re-enactment societies! Functional Steel Breastplates, steel Functional Body Armour, Cuirass and Breastplates section. Great selection of functional and Battle Ready Historical Body Armour - Cuirasses and Breastplates from the Medieval and Renaissance periods. Fully Functional Suits of Armour or (Harnesses of Armour). Can be used for Stage Performance, Jousting or Foot Tournaments, Medieval Re-enactments and SCA events.